Washington (CNN) -- With only 15 days remaining before Election Day 2010 and early voting already happening in several states, the midterm marathon is now a sprint as Democrats work frantically to establish a beachhead to protect their congressional majorities while Republicans hope voter anger over the economy propels them into power. Democrats and Republicans agree on very little other than this: When the dust settles on the 2010 midterms, it's not "will Republicans pick up seats?" but "how many?" Will the GOP pick up the 39 seats needed for John Boehner to wrest the speaker's gavel out of Nancy Pelosi's hands? The midterms might be best described as the 180-degree election. Just two years ago, the GOP was depressed, disorganized and directionless after watching the Democrats gain control of the White House and add to their congressional majorities. How times have changed since Obama stood victorious in Grant Park on November 4, 2008, just having been elected the 44th president of the United States. His campaign themes of hope and change were embraced by a hungry electorate including young and first-time voters looking for solutions, an end to the way Washington does business and a pathway to prosperity. Obama delivered on promises such as health care reform, but the damage to the economy was too severe, the housing crisis too widespread and an upward tick in unemployment just too much. Instead of trying to increase the Democratic majorities in the House and Senate, Obama is now trying to save them. This week, Obama is scheduled travel to six states in five days for more than 10 events on behalf of Democrats such as Senate Majority Leader Harry Reid of Nevada, Sen. Barbara Boxer of California and Sen. Patty Murray of Washington. Meanwhile, Vice President Joe Biden, the administration's campaign workhorse, will make five stops for Democrats including Reid and Murray. First lady Michelle Obama, who enjoys a higher approval rating than her husband and his vice president, is scheduled to appear in Connecticut on Monday for Democratic Senate nominee Richard Blumenthal before heading to New York City for a Democratic National Committee fundraiser. Obama is "hoping" that the voters, who came out for him in 2008, trust him that "change" is on the way and it is just going to take some time. 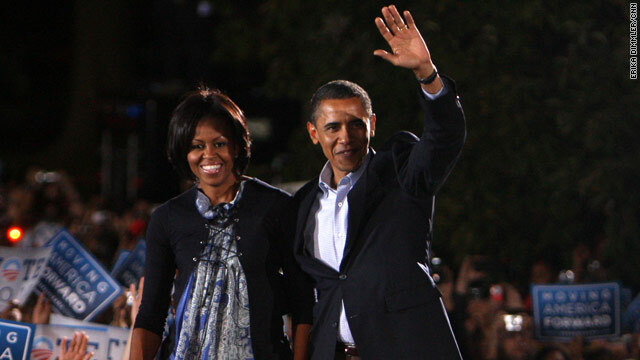 Sunday night, 35,000 people attended a campaign rally at Ohio State University featuring the president and first lady. It was the third such rally he has held in the past few weeks. The fourth and final one is scheduled for Oct. 22 in Las Vegas, Nevada. It is the kind of turnout that Democrats witnessed last night in Columbus that will be needed to hold off devastating losses on Election Day.